Disney Cars Mini Saucer Chair by Disney at Indsight. MPN: K318519. Hurry! Limited time offer. Offer valid only while supplies last. 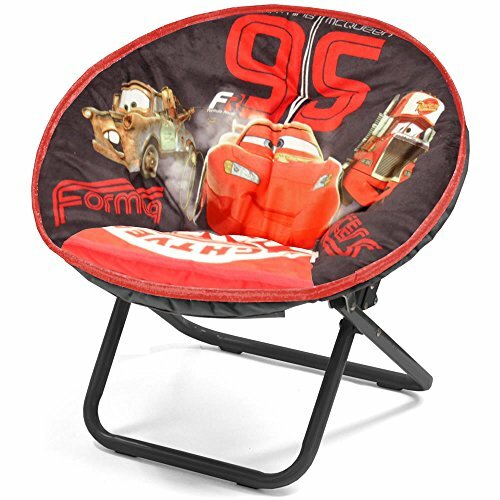 Featuring unique Disney Cars design, your child can enjoy their favorite book or TV show while sitting comfortably on their Disney Cars Saucer Chair. Featuring unique Disney Cars design, your child can enjoy their favorite book or TV show while sitting comfortably on their Disney Cars Saucer Chair. Its saucer shape makes it perfect for lounging or relaxing anywhere. The Saucer Chair is made out of a sturdy metal frame with a polyester cushioned seat for extra comfort. When not in use, the saucer chair can fold together, and with it's plastic carry bag and lightweight composure, it is ideal for travel and storage. The maximum weight for the folding chair is 81 pounds. Do not use this chair on unleveled ground. Dimensions are 18"L x 18"W x 18"H.